Sebastianite Anusha Perera took the top berth from Benedictine Geethika Jayatileka polling 7002 votes in the platinum contest for schools playing division one in the SLSCA tournament. Yamal Siriwardena of St. John’s College, Nugegoda took the lead in the ‘gold’ competition for schools playing in the division two after being number three last week polling 4756 votes, while Thurstan’s Minhad Jaleel climbed to the number four slot after being placed at number seven last week polling 3764 votes in the platinum contest for schools playing in the division one competition at the end of the 5th week’s counting in the Sunday Observer/ Mobitel Most Popular Schoolboy Cricketer of The year 2013 Contest. 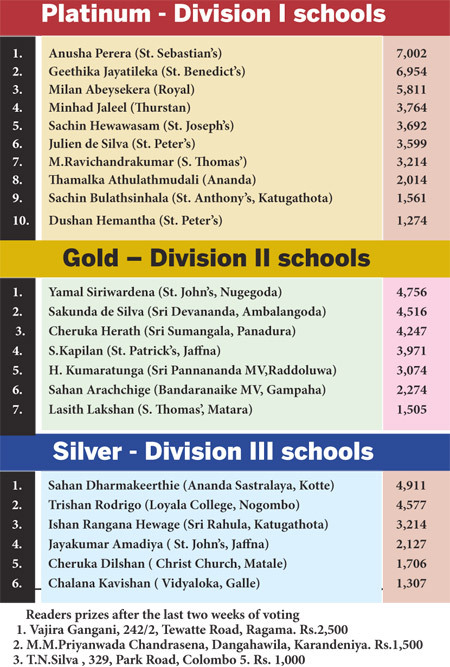 There were no changes in the Silver segment for the division three schools as Sahan Dharmakeerthie of Ananda Sastralaya ,Kotte remained at the top with 4911 votes.